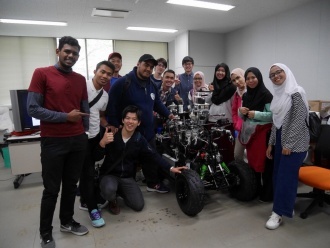 Twenty students from University Putra Malaysia (UPM) visited Kyutech from April 11th to 24th, this year’s first group for the Mobility Program arranged between Kyutech and UPM. The UPM students participated in variety of educational modules coordinated by the Global Learning Support Division of Leaning and Teaching Center at Kyutech: Digital Fabrication Workshop by Dr. Jun Kobayashi, Sustainable Development Workshops by Dr. Masahiko Ota and Dr. Ho Yuek Ming, Laboratory Tour guided by Kyutech graduate students from Dr. Eiji Hayashi Laboratory, Factory visits to SANAQUA TOTO, Shabondama Soap Co., Kitakyushu Eco-Town Project, and Yaskawa Electric Corporation, Japanese Classes, and so on. 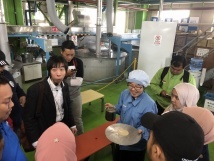 Through these workshops and visits, UPM students were exposed to Japanese newest technology as well as green technology and innovation. They also had chances to experience traditional Japanese cultures, such as calligraphy and Japanese sweets making arranged by Kyutech students and Global Communication Lounge. 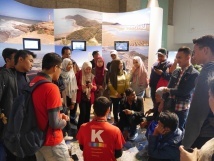 Even though it was a short term program, students were able to gain a lot of new/different experiences and enjoyed their stay at Kyutech fully. Copyright © Kyushu Institute of Technology All Rights Reserved.